Notes: VTech's datassette unit for use with computers of the Laser series (DR-10) was rebranded by Salora and distributed for use with the Fellow (Laser 200) in 1983. It was then re-released in a different box claiming the compatibility with the Manager computer in 1984. 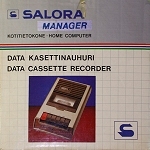 It has the same bronze colours of the Salora Fellow and Manager computers. MORE ITEMS FOR "DATA CASSETTE RECORDER"